When you have access to a consistent stream of Bengali and Resin, every day can seem like IPA day. But on August 1st, International IPA day, it’s official, as breweries, bloggers, businesses and customers celebrate their favorite hoppy brews. Using the hashtag #IPAday, anyone can join the conversation—whether it’s about your favorite type, what you love so much about them, or their growing popularity, all is fair game. Sixpoint’s IPA interpretations celebrate hops on a daily basis. The core selections are of the potent, American variety and demonstrate vibrant hop flavors and aromas. Bengali Tiger falls in the range of a single IPA, clocking in at 6.4% ABV and 62 IBUs. Smooth malt serves as a backdrop for a slash of citrus hop bitterness and a nose full of pine and grapefruit. IPA day is not limited to the single IPA – it is also a celebration of the more extreme Imperial version, and that brings us to Resin. With a 9.1% ABV and a near outrageous 103 IBUs, you might think that Resin would overwhelm the senses. And yes, the first whiff from the can is pretty incredible. But tremendous balance makes Resin almost hazardously smooth. Beware, a beast lies in wait below that soft cap of foam. Our Spice of Life series is a different take on the IPA – brewed dry to accentuate hop flavors and aromas, this single-hopped brew highlights clean hop flavors, rather than pitting sweetness against bitterness. And Righteous Ale is a further exploration into the IPA family tree, with generous amounts of rye adding a spicy and earthy quality to the brew. We’re taking part in a few events on the big day. Bengali will be pouring at Mama Joy’s in NYC, and Resin is representing at the Flying Saucer in San Antonio. 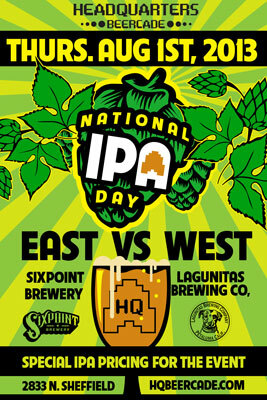 Perhaps most excitingly, we’re meeting Lagunitas halfway, at Beercade in Chicago, for an East Coast versus West Coast IPA showdown: look out for Spice of Life and Resin on tap there. Whatever events and IPAs you partake in on August 1st, let the people know what you’re enjoying using #IPAday!